Congratulations to Kailey and David who were married at the elegant Baronette Renaissance Detroit-Novi Hotel. We had the pleasure of working with Andrea Solomon, wedding and event planner. It’s always a comfort to work with an experienced professional who excel at her job. She orchestrated a beautiful evening from start to finish. 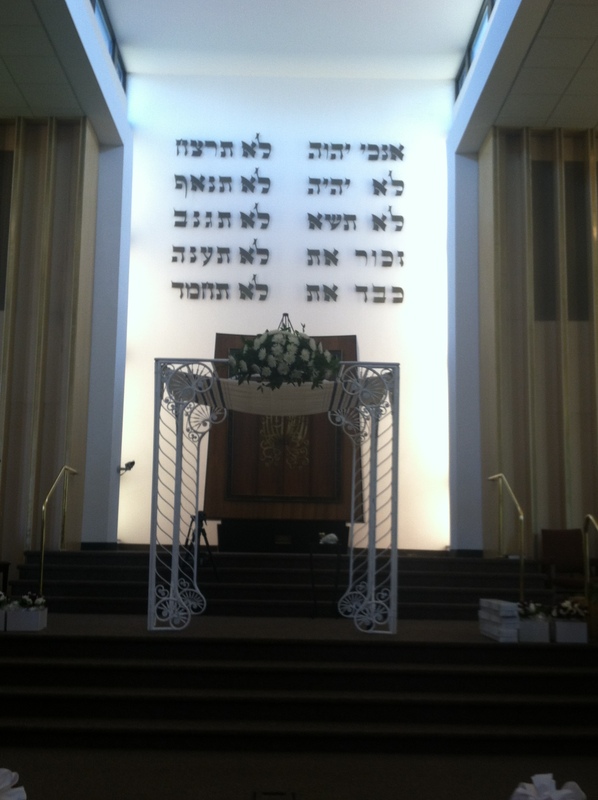 The chuppah was beautifully appointed with fresh flowers. It symbolizes the new home that Kailey and David will build together and is open on all sides to signify that family and friends will always be welcome. The Jewish ceremony involves the lovely tradition of a family processional. Groomsmen escorted the grandmothers to their seats while we played “Here Comes the Sun” by the Beatles. David chose a special song, “We are the Champions” and was walked to the chuppah by his parents. Next, the Kailey’s two sisters and two young flower girls processed to “Love Story” by Taylor Swift. And finally, Kailey, looking beautiful, was escorted to the chuppah by her parents while we played “Can’t Help Falling in Love”. Upon reaching the chuppah, Kailey circled David signifying that their relationship would be based in balance, respect and equal partnership. Rabbi Josh Bennett of Temple Israel officiated the ceremony and noted the significance of the number 7 as being special for this family. We have always enjoyed Rabbi Bennett’s ability to make connections that bring unity and cohesion to the wedding ceremony. While Kailey and David were celebrating this new bond of marriage at 7:00 on the 7th day of November, they also met on the 7th and their grandparents were married on the 7th. Rabbi Bennett finished by noting that God rested and celebrated His new creation on the 7th day as well. Throughout the ceremony, several references were made to the “Legends” baseball organization in California. It was clear that this organization is near and dear to David’s heart and probably the reason we played “We Are the Champions” for his processional. We also noted that the wedding favors were adorable baseball theme cookies. As with most Jewish weddings, the ceremony concluded with the breaking of the glass and shouts of “Mazel Tov”. The tradition is a reminder that relationships are fragile and must be treated with love and tenderness. Guests clapped as we played “Simon Tov” and the wedding party exited for photos. It was a beautiful evening filled with the joy and laughter of family and friends. What a wonderful way to begin a marriage! Congratulations to Lynn and Michael on their wedding at the Troy Marriot this month. This was a traditional Jewish ceremony led by Rabbi Robert Gamer of Congregation Beth Shalom. We performed the Jewish song Dodi Li for the families and bridal party’s processional. Lynn walked to the traditional Yerushalayim Shel Zahav which included the Circling of the Bride and Groom. Following the breaking of the glass and cheers of Mazal Tov, we played Simon Tov as the couple recessed. Annie Joshua, wedding coordinator for the Troy Marriot, was a great help as we relocated for the cocktail hour. We changed music styles and got the celebration moving with Greenday, Taio Cruz, Coldplay, Katy Perry , the theme from Games of Thrones and more. We had several guests peek over our shoulder to confirm what they were hearing and then smile and nod as if amazed. 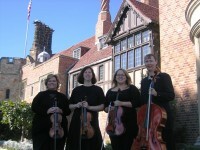 Yes, a string quartet can perform more than classical music. In fact, it’s what we love to do! The reception and dinner continued with the outstanding music of Cancel Monday’s. This is band we have personal experience with and applaud their success and growing reputation. We wish Michael and Lynn the very best as they begin their journey as husband and wife. We are always honored with the privilege of making the music a memorable part a couple’s wedding day. Congratulations to Heather and Jeffrey on their wedding this weekend. It was an elegant affair rich with tradition and celebration. On this first night of Chanukah, Rabbi Aaron Bergman and Rabbi Daniel Syme shared the joy of uniting this beautiful couple in marriage. 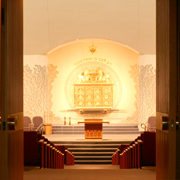 Together, the Rabbis represented the congregations of both Adat Shalom and Temple Beth El. 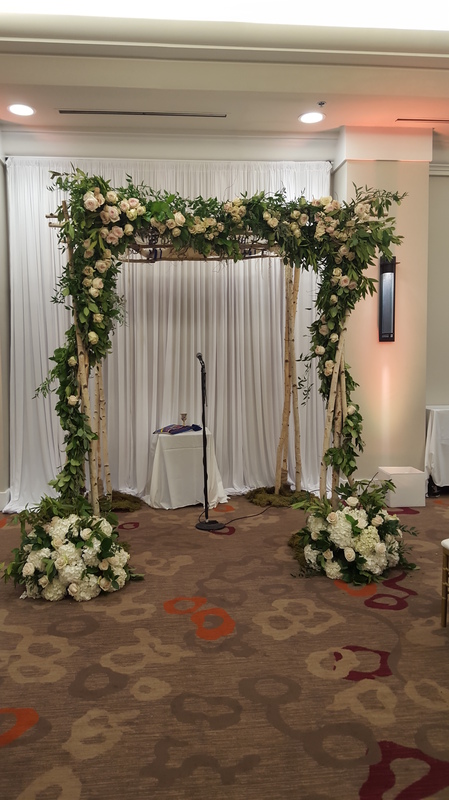 The synagogue and chuppah or canopy were beautifully decorated for the occasion with pink roses, candles and stunning trees that graced the entrance and held the place cards for the guests. Under the expert guidance of Pat Blackwell, Amy and the staff from Party Assurance, the ceremony began with the procession of the family. We played the traditional Jewish wedding music of Erev Ba, Erev Shel Shoshanim, Y-did Nefesh and Bashana Haba. Heather was elegant as she processed to Dodi Li. Cantorial Soloist, Hazzan Daniel Gross, presented a gorgeous performance the Seven Blessings. It was a ceremony rich in personal touches, stories, family reminiscence and love. 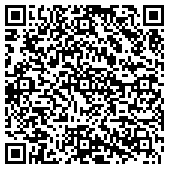 Following the breaking of the glass, we joined Mr. Gross on the celebratory Simon Tov. We wish Jeffrey and Heather much joy or in Hebrew, simcha, as they begin their married life together. Congratulations to Maggie and Jason on their wedding at Temple Emanuel in Oak Park. 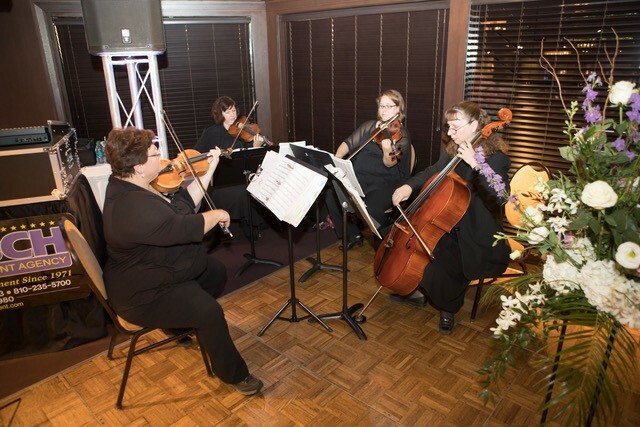 While we had the pleasure of playing classical music for the seating of the guests, the couple chose a unique song for the entrance of the family and bridal party. Apparently, “Fred Bear” by Ted Nugent has special meaning for Jason and his Mother. It was not one that we had in our repertoire but thanks to our arranger, we were able to play it. It was such a big hit that the couple asked us to play it again as Jason and Maggie were greeting their guests following the ceremony. We welcome the opportunity to widen our repertoire with new music and thank Jason and Maggie for bringing “Fred Bear” to our play list. Best wishes to them! It was a celebration of family and tradition for Michelle and Aaron on their wedding day at Temple Israel. The couple chose a combination of traditional Jewish and contemporary music for their ceremony. We performed Agadah for the seating of the grandparents, Bittersweet Symphony for the bridal party, Somewhere In Time for the Groom and Maids of Honor and the specially chosen “I Will” by the Beatles for Michelle’s bridal processional. Cantorial Soloist Neil Michaels performed the blessings in a moving manner and joined us for the recessional, Simon Tov. A unique quality to the ceremony was the couple’s use of a familial shawl that dates back over 100 years. Rabbi Harold Loss encouraged the couple to feel the love and history of their ancestors as the shawl was wrapped around them. Following the ceremony, we moved to the lobby and played Beatles, Sinatra, Motown and upbeat classical for the cocktail hour. Pat Blackwell of Party Assurance and her staff did an outstanding job coordinating all the parts of this evening. We extend Michelle and Aaron our very best wishes as they begin married life together.